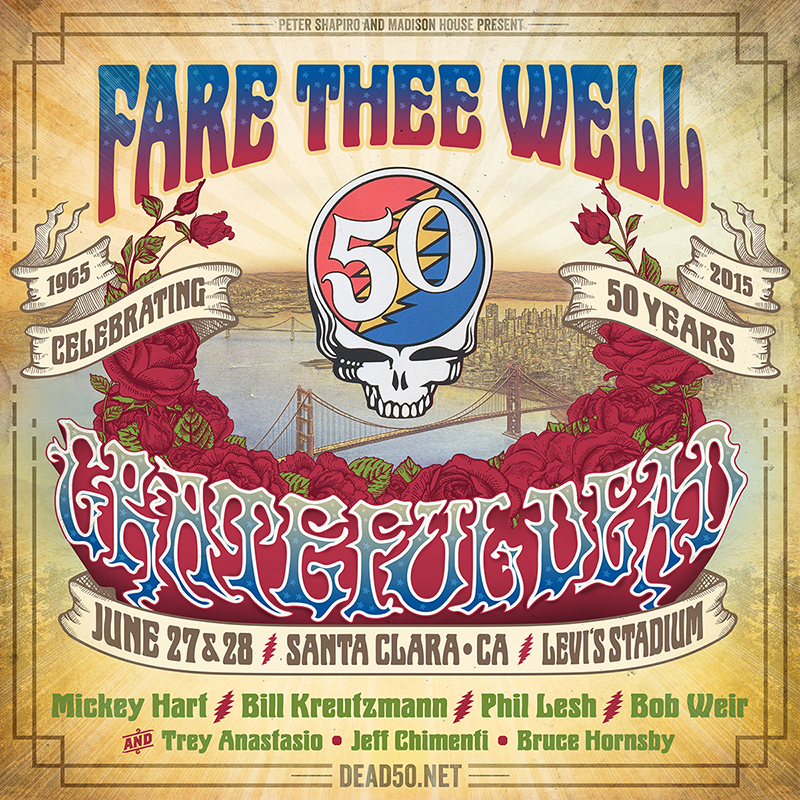 The original members of Grateful Dead — Mickey Hart, Bill Kreutzmann, Phil Lesh, and Bob Weir — have announced two additional shows at Levi’s Stadium in Santa Clara, California on June 27th and 28th, as part of their “Fare Thee Well: Celebrating 50 Years of Grateful Dead” run. Along with the three shows at Chicago’s Soldier Field on July 3rd, 4th, and 5th, the run will mark the original members’ last-ever performances together. The band will be joined by Trey Anastasio (guitar), Jeff Chimenti (keyboards), and Bruce Hornsby (piano) and perform two sets of music each night. The ticket purchasing period for the Santa Clara online mail order has ended. There will be no additional tickets sold for these events. Good luck to all those who participated! If you did participate, our technology will randomly select the orders, assign seats, charge credit cards and all customers will be notified whether they will receive tickets or not. If you do not receive tickets, stay tuned for details regarding how you will still be able to experience these shows wherever you are. Thank You! We are excited to once again team up with CID Entertainment, offering Ticket and Travel Packages that will enhance your experience in Santa Clara! CID Experiences include premium seats and amenities. Travel Packages offer a wide range of hotel choices in the Bay Area with round-trip transportation to Levi’s Stadium included, and can be purchased with your preferred ticket type. The shows will be held at Levi’s® Stadium, the home of San Francisco 49ers and a true homecoming for the Bay Area band. Saturday, June 27 and Sunday, June 28, 2015. What time are the shows? On Saturday, all stadium gates will open at 5:00PM and showtime is 7:00PM. On Sunday, all stadium gates will open at 4:00PM and showtime is 6:00PM. What are the on-line on-sale dates? All tickets for the Levi’s Stadium shows are available through an on-line mail-order ticketing system through Tues April 14 at 11:59pm EST, for more details please visit dead50.net. Will Two-Day Passes be available? Yes. Two-Day Passes will be offered. What ticket and travel packages will be available? What time will the parking lots open? Levi’s® Stadium parking lots open at 3:00PM on Saturday and 2:00PM on Sunday. No overnight parking will be permitted. Every ticket holder who plans to park at the stadium needs to secure a prepaid parking pass prior to arriving to the show. No parking passes will be available onsite. Those without passes will need to arrange alternate transportation plans. Additional information on purchasing advance parking will be made available to ticket holders after the on-sale is completed. all guests ages 2 and above must have an event ticket. Guests under the age of 2 are free as a lap baby and do not receive a complimentary seat. If you have a child under age 2, and would like a seat for him or her, you must purchase a ticket. In order to get your taper credential(s), you will need to go to the Visa Box Office located at Toyota Gate F on the night(s) that you have taper tickets. You must have a picture ID to claim the credentials. The box office staff will issue you a credential that will grant you access to the taper section. You will be mailed your tickets. However, these tickets by themselves will NOT grant you access to the taper section. You must go to the Visa Box Office located at Toyota Gate F to pick up your taper credential(s) before the show. The parking map below lays out the various parking lots that will be available on the days of the event. Every ticket holder who plans to park at the stadium needs to secure a prepaid parking pass prior to arriving to the show. No parking passes will be available onsite. Those without passes will need to arrange alternate transportation plans. Pre-Paid Parking Passes will be available for purchase in the upcoming weeks. Parking lots are designated by pass, color, and lot number. Guests are encouraged to adhere to posted signs and instructions from event personnel. All guests must be in possession of a valid event ticket, pass, or credential to park in a designated parking lot. Parking spaces are not pre-assigned unless otherwise posted or purchased online via Ticketmaster or on the Levi’s® Stadium app. 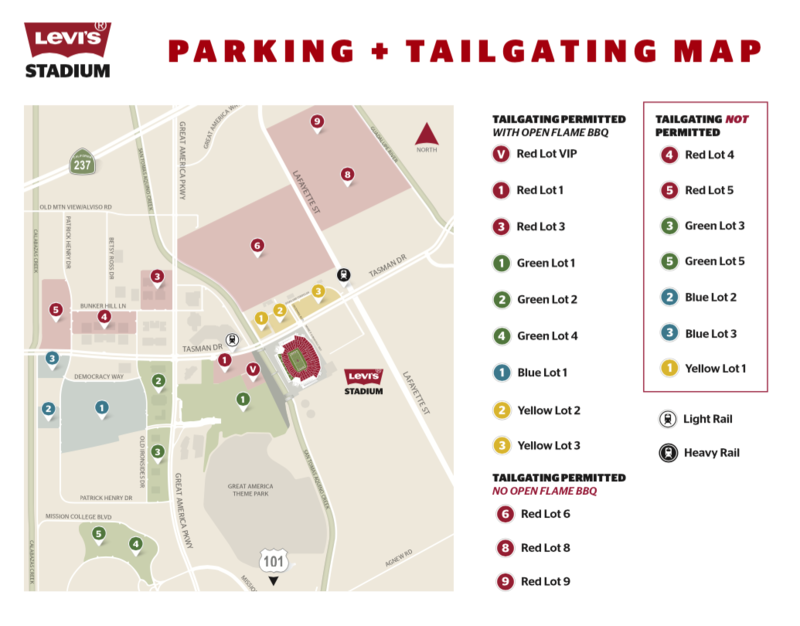 Levi’s® Stadium guests will be directed to their parking location by stadium personnel. Reserving spaces is NOT permitted. The parking pass allows for one space per vehicle only, and will be limited to vehicles measuring less than 17′ in length and 8′ in width. Vehicles measuring more than 17′ in length and/or 8′ in width are required to park in the designated oversized vehicle/RV parking area in Green Lot 1 if space allows. Refunds will not be made for lost, stolen, or unused parking passes. A refund or credit will be made only for event cancellations. Unauthorized vehicles or vehicles failing to park in the designated areas will be towed and stored at the owner’s expense. Tailgating is permitted in specified areas only. Non-compliance may result in ejection from the lot without compensation. Tailgating is defined as; the use of any item (including tables, chairs, free-standing canopies or umbrellas, awnings attached to recreational vehicles, coolers, barbeques, grills, games, generators, televisions, sound systems, food or drink, food or drink preparation or serving equipment, or other items as identified by the City Manager or designee) for the purpose of an outdoor gathering by one or more people prior to, during or after a scheduled stadium event. Each parking space must be used for vehicle parking only. Glass containers are not permitted in ANY lot. Self-contained campers must park in the designated oversized vehicle/RV parking area. The Stadium Manager or its agents shall not be responsible for fire, theft, damage or loss to vehicles or any other article left in stadium affiliated parking lots. Event parking lots are subject to closure without notice. Levi’s® Stadium encourages carpooling and the use of public transportation. As an incentive, to those traveling in buses that do not tailgate will park free of charge. Please refer to “Charter Buses” section for further information. Will any other bands be opening for the Dead? One empty plastic or reusable water bottle per person is allowed at entry. Will ADA seating be available? If you require ADA seating or access to the American Sign Language interpretors section please enter the online mail order. If you win tickets you will be given an opportunity to select the respective seating area for your needs. Where can I find the Wharf Rats at the show? The Wharf Rats will have a table near the Participation Row area, on the main concourse close to the Intel Gate A. Where can I find other non-profit organizations at the show? Can I take public transportation to Levi’s® Stadium? Intersection of Tasman Drive and Calle Del Sol VTA light rail trains will drop off and pick up at the Great America Station located north of the stadium. For more information please visit www.vta.org, or call (408) 321-2300(408) 321-2300. Capitol Trains provides services to Levi’s® Stadium from Auburn, Rocklin, Roseville, Sacramento, Davis, Suisun/Fairfield, Martinez, Richmond, Berkeley, Emeryville, Oakland, Hayward, and Fremont/Centerville. For more information please visit www.capitolcorridor.org, or call (877) 974-3322(877) 974-3322 FREE. Caltrain provides services from San Francisco to South San Jose with stops all along the peninsula. On event day, Caltrain transports passengers from all locations to connect with VTA light rail trains or buses at the Mountain View Transit Center, located at Evelyn Ave, and Castro Street. For more information please visit www.caltrain.com , or call 1 (800) 660-42871 (800) 660-4287 FREE. Re-entry is not permitted at any Levi’s® Stadium event. In case of emergency, guests can contact the ticket taker and/or security supervisor at the nearest gate. All approved bags are subject to inspection upon entry and are subject to additional inspections within the stadium. Guests with oversized bags or other prohibited items must check these bags or items at bag check sites located outside of Intel Gate A, and Toyota Gate F. These sites close one hour after the completion of the event. Complimentary bicycle valet service is located in Red Lot 1 near Intel Gate A, outside of the stadium security perimeter. Bicycle valet will be open four hours prior to the event through one hour upon completion of the event. Unattended bicycles that impede pedestrians are subject to removal and/or relocation. Levi’s® Stadium and/or its agents, shall not be responsible for fire, theft, damage or loss to bicycles or any other article left outside the stadium. Levi’s® Stadium encourages all bicyclists to use the bike valet and/or the bicycle storage locations provided. Bicycle traffic on the San Tomas Aquino Creek Trail will be diverted in order to ensure the integrity of the stadium’s security perimeter. This temporary path diversion will send northbound traveling bicyclists east along Agnew Road, north along Lakeshore Drive, east along Gianera Street, north along the off-street pedestrian and bicycle path at the Gianera Street terminus, north through the VTA Parking Lot, northwest along Stars and Stripes Drive, south along Centennial Boulevard, and west along Tasman Drive, where bicyclists will be able to find the Bike Valet locations. Tailgating is defined as; the use of any item (including tables, chairs, free-standing canopies or umbrellas, awnings attached to recreational vehicles, coolers, barbeques, grills, games, generators, televisions, sound systems, food or drink, food or drink preparation or serving equipment, or other items as identified by the City Manager or designee) for the purpose of an outdoor gathering by one or more people prior to, during or after a scheduled stadium event. Tailgating will cease after the show starts. There are three (3) First Aid locations at Levi’s® Stadium. Guests that have lost an item during an event are encouraged to visit one of the Guest Services kiosks located within the stadium on the main and upper concourses. Items that have been found are turned into these locations during events. Guests can also inquire from home about lost items by visiting our website at www.LevisStadium.com. Levi’s® Stadium will make its best efforts to match found items with those reported lost by guests. Items turned into Guest Services will be held for 60 days before being disposed of or donated to an appropriate charitable organization. Levi’s® Stadium is not responsible for any lost or damaged items. In accordance with the Santa Clara City Ordinance, Levi’s® Stadium is a SMOKE FREE facility, which includes, but not limited to, cigarettes, vapor cigarettes, and electronic cigarettes. Designated smoking areas have been established on the fence along the west side between Intel Gate A and SAP Tower Gate B & SAP Tower Gate B and Dignity Health Gate C. There is an additional location outside Toyota Gate F within the stadium perimeter on the sidewalk of Marie P. DeBartolo Way. Why are we doing the show at Levi’s Stadium? For all other questions regarding Levi’s® Stadium and regulations, please refer to their facility guide here.